We’ve upgraded traditional Scotch eggs for the perfect and #JustDelicious grab-and-go breakfast or lunch-box treat. 1 Bring a saucepan of water to the boil, then reduce to a simmer and add the eggs. Boil the eggs until just soft, about 6-7 minutes, remove from the saucepan and allow to cool, peel and set aside. 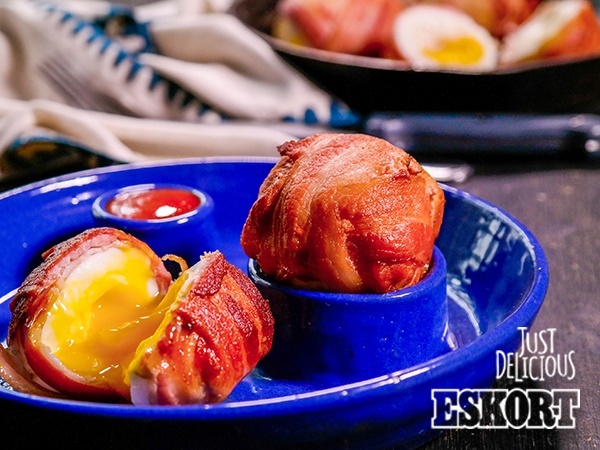 2 Season each egg with a little salt and pepper, then wrap each egg with a strip of streaky bacon, tucking in the ends. 3 Heat the vegetable oil in a shallow frying pan and fry the eggs, turning continuously until the bacon has turned golden. 4 Remove from the heat and serve warm, or chilled with your favourite sauce or condiment (tomato sauce is an all-time favourite).